Our first podcast episode of 2017 was released today! In this our 13th Episode we cover topics like earning Triple Avios on British Airways Flights, the Great Changes to Alaska Airlines Mileage Plan, and give a brief outlook on 2017!. Check it out on our Podcast page or subscribe on iTunes/Google Play to get it automatically. You can earn 60 Bonus AIR MILES for spending $40 or more Rexall until the 19th. Get the coupon here. You can now pay to access Emirates' Business Class and First Class lounges in Dubai. $100 and $200 respectively is what it will cost you if you are not flying in Business or First Class of course. If you already have access to the Business Class lounge (ie flying Business Class) you can pay $100 to access a First Class lounge. Find out more here. 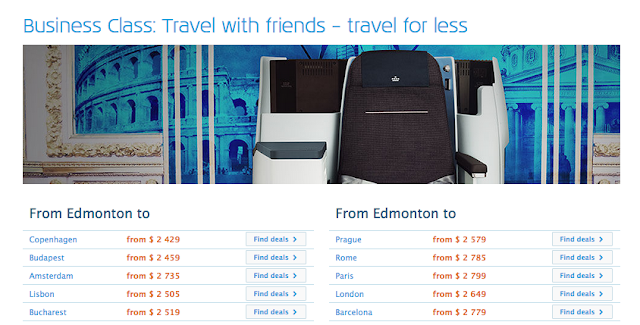 KLM has some great companion business class ticket offers out of Edmonton! If you book 2 business class tickets each person can fly for as as little as $2,429 all in to Europe! Book by May 31 for travel until Jun 30 17. Find out more here.